Not all patients are medically suited to robotic technique and to reduce the risk of significant complications it is critical that these patients not be inappropriately operated using robotic technology. Patients absolutely and relatively unsuitable for robotic surgery would include those who have had a prior major intra-abdominal surgery, laparoscopic mesh hernia repair and certain patients who have had prior prostate surgery. 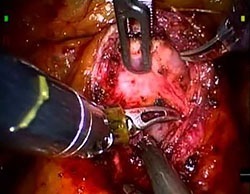 Patients suffering from glaucoma or other eye diseases may not be suitable for robotic technique as it involves surgery in the head down position. Surgical incisions for open vs.robot-assisted radical prostatectomy. Robot assisted laparoscopic radical prostatectomy involves the use of minimally invasive laparoscopic technique. The prostate gland is removed via six small abdominal incisions, the surgery is facilitated by a powerful intra-abdominal digital camera that allows for precise magnified visualisation of the surgical anatomy. Laparoscopic visualisation of the prostate during robot-assisted surgery. The patient is usually discharged 48 hours after surgery, thereafter physical recovery is generally rapid. 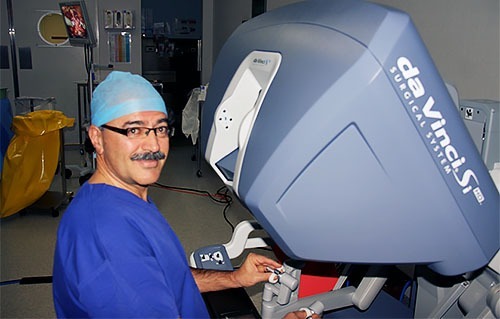 Utilising robotic technology Dr Katelaris aims to achieve the three goals of radical prostate cancer surgery, these are cure of the cancer, preservation of continence and preservation of erectile function.